Vehicle Wraps By Apple Graphics Inc. Vehicle wraps are a great way to get noticed, anytime, anywhere. 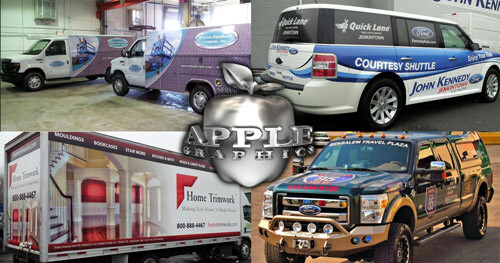 Vehicle wraps serve many purposes, and Apple Graphics Inc. can make one custom for your needs. There are several different kinds of wraps that can fit your price range. Apple Graphics Inc. specializes in vehicle wraps, not only do we install them but we custom design every one of our wraps. No matter what you want we can make it work. We can do anything from simple lettering to Full wraps, covering your whole vehicle. We can wrap any vehicle. Below are some examples of different types of wraps we do. Top left is of two trucks in Easter High Reach’s Fleet. Fleet wraps are a great way to look professional and for people to recognize all of your company vehicles. Top right is a Car Dealership Half Wrap for John Kennedy Ford, on a Ford Flex. This partial wrap is cost effective and eye catching. Not only does this wrap utilize the car like a full wrap would but it also includes die cut lettering for all of the wording. Bottom left is a huge box truck we recently did for Home Trimwork, This wrap presents all of the company’s different services while showing the kind of quality work they do. Bottom right is a truck done for Bensalem Travel Plaza, all of the graphics were custom designed by our 3D designer. Everything has been printed on printable reflective vinyl, which gives maximum visibility to other drivers on the road.